Attention San Diego! Nick Verreos will be showing his Spring Collection at the W Hotel in San Diego on Thursday night, August 16th. For more information about the show write to W Hotels Events. This is for adults only and Nick will serve us as a "celebrity bartender" which should be a lot of fun. I have been looking forward to this for weeks and I really really need a vacation! BPR Field Reporter Extraordinaire, John Patsais brings us this wonderful report from the "Bad Boys of the Runway" event in San Francisco. Thanks again, John P, and thanks also to Marc Huestis for inviting us along! In the City by the Bay, known all over the world for its open-mindedness to everything from politics to fashion, the fashionistas, pop culture enthusiasts, poseurs, and curiosity-seekers of San Francisco were treated to a display of glamorous and cutting edge fashions this past Friday evening. The famous Castro Theater served as a haven for fashion fans who were treated to dazzling displays of sartorial genius and unbridled ingenuity via classic film clips as well as contemporary designers and local drag artistes. In this “anything goes” city, a fashion designer with an “outside the box” mentality, vision, passion, and cutting edge aesthetic could very well find success. Project Runway alums Santino Rice and Jeffrey Sebelia may have very well found a second home outside of Los Angeles, judging by the reception they received from San Francisco locals during the “Bad Boys of the Runway” event. Host Marc Huestis led the panel discussion, and we were quickly reminded why Rice and especially Sebelia have duly earned their reputations. Tim, we love you more than words could express. Thank you so much for the love, the friendship and the support that you have given to us at BPR. We can't wait to see you on Project Runway Season 4 and we look forward to the debut of Tim Gunn's Guide to Style. Happy Birthday, Dear Tim. 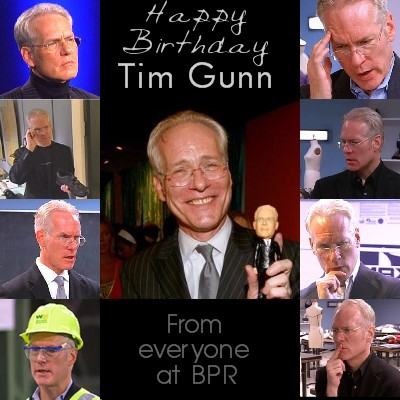 And, just for fun, Photoshop wizard Phaolo gives us his birthday greeting to Tim Gunn. 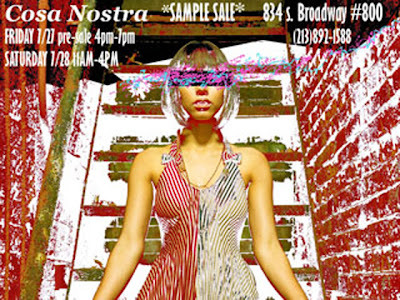 First - another sample sale this weekend! Jeffrey Sebelia's designs will be available today and tomorrow in Los Angeles. Here is a nice article about Emmett McCarthy from the Berkshire Eagle. If you are able to get to either of these events, we would love a field report. Fashion Week Daily has an interview with Heidi Klum about her latest jewelry collection. If you are in NYC you can stop by Malan's Atelier for a sample sale. He will also be selling some designs that have been worn by celebrities. Don't forget your cameras! Santino Rice made a guest appearance on "America's Next Producer" last night. Click here to watch the entire episode online. If you are near Lenox, Massachusetts you can attend Emmett McCarthy's Trunk Show at Glad Rags from 10:00 - 5:00 on Saturday the 28th. If you are near Springfield, Illinois you could attend "Fashion Knight" at the Abraham Lincoln Presidential Museum on Saturday the 28th at 8:00 PM. If you are in San Francisco of course you MUST attend the "Bad Boys of the Runway" event at the Castro Theater on Friday night at 7:30. Santino Rice and Jeffrey Sebelia will be there along with many other fashion and film fans. 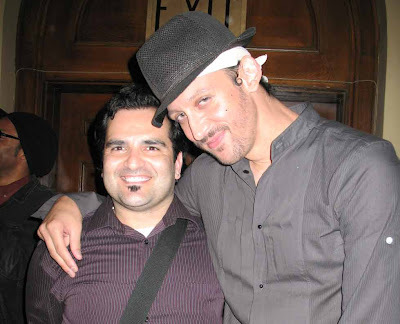 Here is an interview with Santino Rice in the San Francisco Bay Guardian, and here is more about the event from sfgate.com. Daniel Vosovic is interviewed in the current issue of Metrosource NY. Thank you for acknowledging the importance of blogs, Daniel! Click here for the rest. Thanks for the scans, Michael. 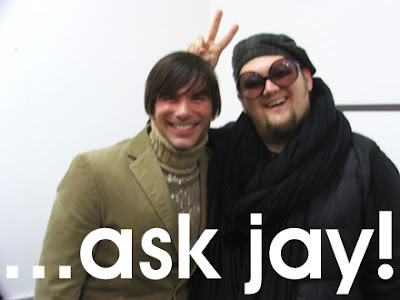 Jay McCarroll is scheduled for a podcast/interview on Thursday at fredflare.com. Fans are encouraged to submit questions. Mychael Knight on "My Sweet Sixteen"
Ever wonder what Mychael Knight would charge for a custom-designed dress? 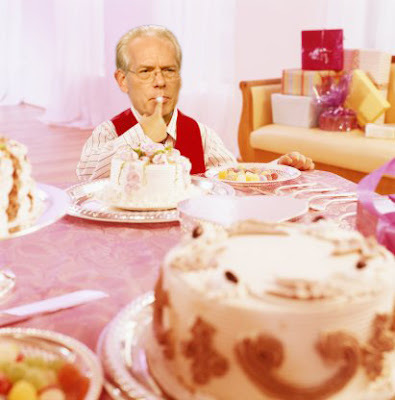 Watch this clip from "My Sweet Sixteen" to learn the answer. You can actually watch the entire episode and see how the dress turned out. What do you think? I think that Mychael knows exactly who he is, who his market is and what he is doing. Congratulations Mychael! Nick Verreos has just returned from Miami where he attended the "Premios Juventud" awards which is (as I understand it) the Latin equivalent of the "Teen Choice Awards." Nick was chosen and commissioned to design this outfit for the "Orbit Gum Girl," Raquel Jiminez. They wanted a retro sixties vibe and Nick certainly delivered! Congratulations Nick. 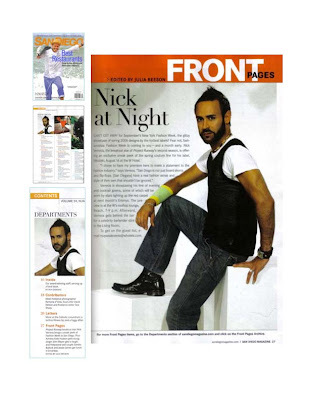 Nick is very busy preparing for his Spring 2008 Show in San Diego on August 16th at the W Hotel. Details to follow and I am definitely going. Please join me, I'd love to meet up with some BPRs while I am there! Our friend and fellow blogger Linda Merrill is planning to blog the new season of HGTV's "Design Star" which premieres tomorrow night. Join her here. Here is a nice interview with Tim Gunn from Insidebayarea.com. Thanks Deb. Janet Charlton hopes Project Runway will win the Emmy. We do too, Janet! We've all seen the "Project Jay" show where Jay McCarroll works hard to create the perfect dress for Heidi Klum. Well, here is a little more info from Heidi. You know, I think she SHOULD wear something from a Project Runway designer! Chloe Dao will be appearing at the BlogHer Conference in Chicago July 27 - 29th. 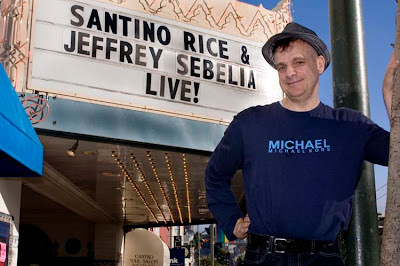 Vincent Libretti is interviewed here in a Santa Monica Daily Press article about local reality stars. From the video description: "Fashion designer Mychael Knight Debuts new 2007 summer collection outside a Laguna Beach, CA Starbucks Coffeehouse as part of their "Let's Meet at Starbucks" Southern California Summer Campaign. He is joined by friends Lauren Conrad, Audrina Patridge and Project Runway Models." 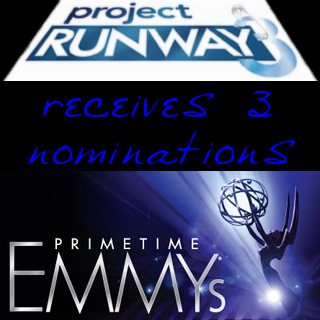 Project Runway was nominated for three Emmy Awards this morning by the Academy of Television Arts & Sciences. For the third year in a row Project Runway competes in the Outstanding Reality-Competition Program category. Project Runway was also nominated in the Outstanding Cinematography For Reality Programming and Outstanding Picture Editing For Reality Programming categories. The episode offered up for consideration was "Iconic Statement." You can click here for all of the nominations and to see which shows are competing against PR3. ETA: You can click here for Bravo's announcement. We congratulate Bravo, the Weinsteins, Magical Elves, Rich Bye, Heidi Klum, Andy Cohen and the other producers of the show! Mychael Knight was recently spotted at the launch of a new record label in Atlanta. Read more here. Philadelphia fans can look forward to a possible rescheduling of Tim Gunn's book signing for late August. More information here. Tim Gunn is quoted here describing the season four designers. Yesterday's Amazon Blog featured a podcast interview with Tim Gunn. Thanks Chris! There is so much to catching up to do, but that can wait. At the moment I need your help. 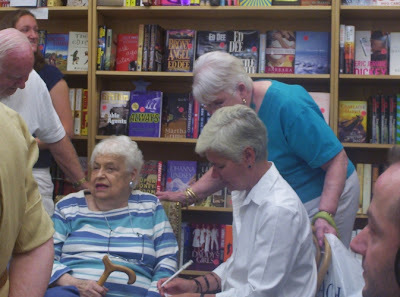 May I trouble you to please inform the BPR readers that I will NOT be attending next week's book signing events? I am scheduled for the Free Library of Philadelphia on Tuesday, July 24 and at the Bryant Park Reading Room on the following day, July 25. These days conflict with the taping of Guide to Style, but they remain on the Abrams website. I'm in Los Angeles for BRAVO's presentation of Guide to Style to the Television Critics Association and I'm leaving for NYC momentarily. I am so grateful to you for your help! ...and at last we can all get started on achieving our "Style Zenith." Click here for the press release. UPDATE: Kara sent us some scans of the article. Click here to see the entire feature. I was just in California for the FIDM "Three Days of Fashion," & I got to meet Nick at both the L.A. campus & in San Diego. I only got to meet him in LA because I was visiting that campus & had a meeting with an adviser there, and told him how I was excited I was when I found out Nick was an instructor there. It was the LA Campus' last day of the 3 days of Fashion, and Nick was the special speaker, and the adviser let me crash it to meet him. Then he was in San Diego for the same thing. Here are some pictures. They're not the greatest, but they work. He brought Kayne's model from Season 3, Amanda, with him in LA to show some of his newest designs. If you are a model living in or near Springfield Illinois, this could be fun! Open modeling tryouts for the Abraham Lincoln Presidential Museum's "Fashion Knight at the Museum" will be held from 10 a.m. to 3 p.m. today at The Wardrobe, 830 South Grand Ave. W.
Women sizes 0 through 2 are needed to model clothing during the July 28 "Fashion Knight," a past-to-present comparison between Mary Todd Lincoln's trend-setting fashions and today's styles, including those of fashion designer Mychael Knight of "Project Runway." Staff from The Wardrobe will make the final selections and notify the models that are chosen. For more information on the tryouts, call 528-5785. For tickets to the event, call 558-8934 or go online at www.alplm.org. 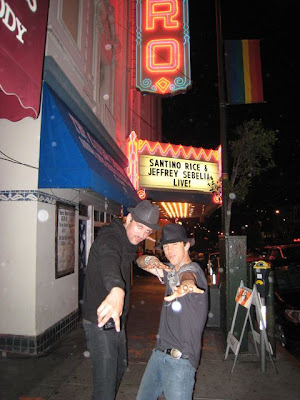 Santino Rice and Jeffrey Sebelia will be in San Francisco on July 27th for the "Bad Boys of the Runway" salute to Fashion in Films at the Castro Theatre. BPR's own John P will be on hand to provide coverage. Click here (scroll down) for more info. Also, Tim Gunn will make another stop on his book tour in Philadelphia on July 24th and at the Bryant Park Reading Room on July 25th. Click here for details. 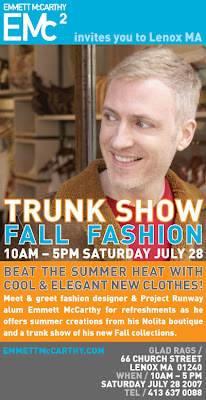 Emmett McCarthy in Lenox, Massachusetts on July 28th! We are a community blog and we rely on you to send your stories and links to Project Runway-related events. If you are able to make it to Glad Rags in Lenox, we'd love to see your photos and to read about your day. Thanks everyone! Fellow bloggers at Reality on Bravo met Tim Gunn along with his mom and sister in Bethany Beach last weekend. Here is a photo of Tim's mom and sister from Reality on Bravo. And here is a photo of a very happy Allison! Kayne Gillaspie will be in Anchorage Alaska on Thursday June 12, headlining the Fashions for Food Fashion Show at Nordstrom, a fundraiser for local nonprofit Dare to Care. Also on Thursday night, Zulema Griffin will be showing her latest collection at VerveNYC. For tickets and information click here. Mychael Knight will be at the first Atlanta International Fashion Week in August. Click here for more info. Looking for some fun fashion news? Here is an article from the Wall Street Journal about Couture Design. Don't miss the slide show and video. 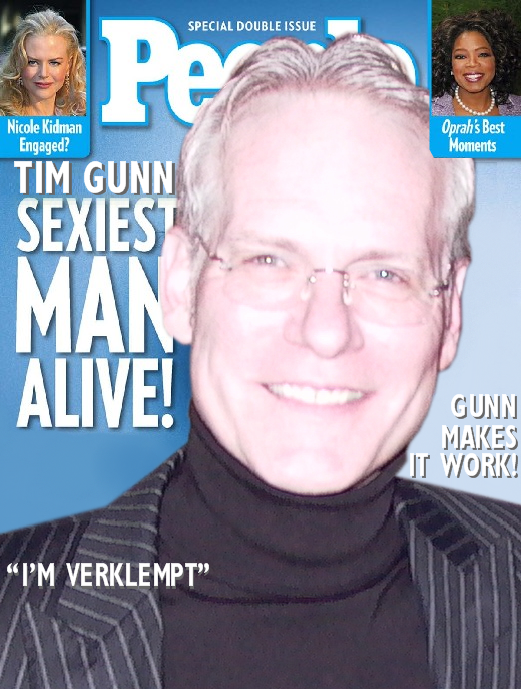 The big news today is that Tim Gunn resumes his book tour. He makes an appearance in Delaware tonight and tomorrow, the first stop since the filming of Season 4 of Project Runway has concluded. * Click here for a story about this leg of the tour. And click here for all of the book tour information from the publisher. TiFaux is wondering who would win in an Anderson Cooper/Tim Gunn fight. Don't miss their strengths/weaknesses. Enter a handbag design contest that will be juried by Project Runway Season 1 winner Jay McCarroll. Click here for the details. This is a free contest with a deadline of July 16th. You still have time to have your creation critiqued by Jay! Malan Breton shares a special, inspired message to his readers on his Bravo blog found here. Heidi Klum was shopping in (surprise) Victoria's Secret! Can you imagine that she actually likes lip gloss? Click here for delicious details. In other Heidi news, OK! Magazine and Celebrity Baby Blog tell us not to expect a baby bump in the near future. *Of course they have not filmed the Reunion or Finale episodes yet. Shawn Pelofsky of GoWeHo.com interviews Nick Verreos of Project Runway Season 2 on the red carpet in the video above. Lynn and Alex get fashion tips from Nick below. Watch the Project Runway Season 3 fireworks today at 10:00 AM Eastern beginning with Episode 1 all the way through the 2-part Finale. The tale of the little black dress. It was a hot day in mid-May when I journeyed to the East Village in New York City. I was giddy and giggling despite the sweltering Tuesday afternoon. You see, I was coming in for a very special visit with my darling friend and fellow glamour-puss, Malan Breton. 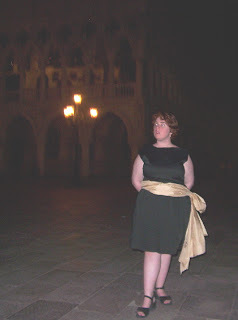 A few days before I discovered Malan auctioning off the most precious little-black-dress which would be perfect for my summer trip to Venice, Italy. I immediately called him and and politely asked (begged) for the fabulous frock. Being the darling he is, he agreed to let me have it. We arranged a time for a fitting and I came in. We greeted each other with hugs and kisses and Malan got to work. He had made a sort of rough-copy of the dress and fitted it to my body. I must say, Malan is an absolute master of his craft (“Did I prick you?” “Nope.”). He handled the dress with extreme care as well as the champagne sash and in a very short time, completed the outfit. We packed it up in some garment bags and then wandered around aimlessly until we found a cab to take me back to the train and him home. Well, since then, the dress has had quite an adventure. It survived hours on airplanes to Italy, beach parties at the Lido and fun wanderings around Piazza San Marco at night. I never felt more fabulous or stylish in my life. I love that dress to death and I will wear it every chance I get. This item appeared in USA Weekend on Sunday. Thanks for the scan, Kenneth. Here is an interview with Tim Gunn in Palm Springs Life. The New York Post summarizes what I have about 20 e-mails about. Thanks Post, and thanks to everyone who sent in links to this story. Tim Gunn makes an appearance in Bravo's new show "Hey Paula." If you missed the premiere you can catch the first two episodes today. Also, there is a Project Runway Season Three marathon on Wednesday. Happy Monday everyone! I've been traveling and I'm a little behind on things - I'll try to catch up today. According to our best estimates the Season Four shooting should be wrapping up about now. Tim Gunn will head to Delaware at the end of the week for another couple of stops on his book tour. I hope some of you will be able to attend. Please send photos. We have a link to Tim's schedule in our sidebar. I just wanted to rattle off a little email thanking BPR for the highlight of my work week. I've occassionaly lurked on BPR for awhile and when I saw the message the other day for the Kara Janx sample sale I was so excited. I've wanted to get the kimono top for awhile and I thought that this would be a great opportunity to do so being that it was only a few blocks from where I work, I had a meeting yesterday and I couldn't make it which I was so upset about, but first thing today I went over there. So I walk into the sale, and who is sitting there but Kara herself, for some reason I was so nervous, but i pulled it together (somewhat) enough to talk to her and say how much I loved her flower dress on the show. Anyway Kara couldn't have been nicer, and I got some great stuff. It's really nice to see people that aren't affected by the recognition that comes with being on television and are still all about the clothes. Kara was so refreshing and down to earth and her clothes are beautiful her success comes as no surprise to me. Just thought I'd write and let you know that yesterday I went to Kara's sample sale in NYC! At first I was like "Am I in the right place?" as I got off an elevator and ended up in a workroom. I turned my head to the left and there stood a bunch of racks of Kara's clothes and two people "minding the store". Once I started digging in though, I could not believe the bargains! She had tons of kimonos - all different styles, colors, fabrics, etc., some kimono tops, bikinis, t-shirts and other tops. I picked up a FABULOUS kimono dress (sleeveless "sweatpant" gray with tan trim - the color combination caught me right away - I'm not sure why but I LOVED it!) and a all-black kimono top! Tried everything on today - love it all!